Need unique outdoor or indoor carnival games? Check out the Interactive Playsystem – slap happy cones. This carnival game is great for all ages. Watch the youtube video to see all the fun ways to play. Try our system with or without the racetrack. Looking for a new game that your customers, kids or employees have not see? Then try this unique game rental idea that combines fun with versatility. The game can be configured in so many ways that it has endless options to engage participants from age 3 to 100 and goes great with your bounce house rental. This fast pace high energy game tests your reflexes, coordination and endurance! It can be used for Football Training, CrossFit Exercise, Team Building, Youth Sport Camps, Carnivals, Birthday Parties, School P.E. Games and any other event where you want to get the adults and kids interacting with each other! The rental comes with 10 cones and can also be configured with the inflatable raceway or without. The wireless scoreboard has sounds and a countdown announcer to make the play even more fun. Best of all, the slap happy cones can be set up anywhere as these slap happy crazy cones do not require an electric outlet during your event. sounds when tapped and connect wirelessly to the scoreboard. The game system allows for 5 different game modes. 1. Light Hunter: Tap as many of your color lights as you can before time runs out. The Player with the most tap wins! 2. Steal the Light: When the light shows up tap it as fast as you can before your opponent gets it, first to tap gets a point. The player with the most taps wins! 3. Back to Base: Tap as many lights as you can, while return back to “base” after each tap. 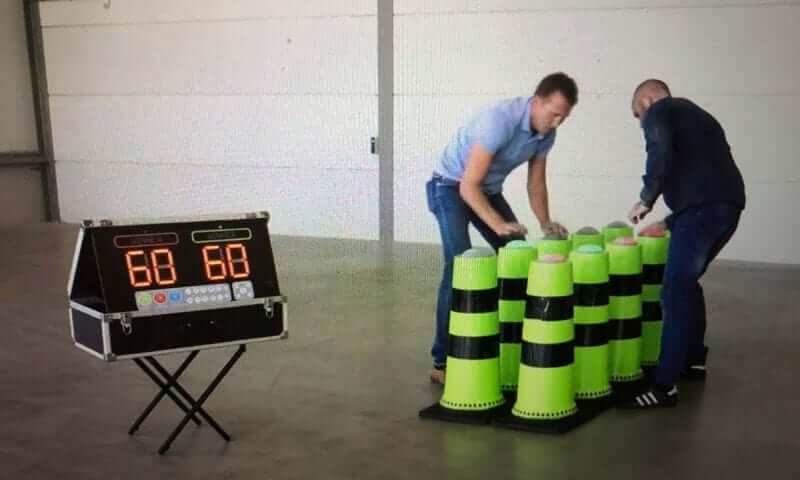 This game is only played with the LED Cones and LED Bounce. 4. Hit Counter: Set a hit goal 10 -25-50-100 then you and your opponent see who reaches it first. The first to reach the selected amount wins! 5. Memory: This is a 3-minute game. The goal is to find the same sound in two different lights. Each light has a speaker and when it’s pressed it makes a sound. Once a match has been made the matching lights turn blue and the that team gets a point. Play continues until all light have been matched (turned blue). Depending on the type of event and the length of time you want each group to play; you can set the game up for: 45 sec, 90 sec, 180 sec, 270 sec, and 600 sec. Through put per hour: 60, 120, or 240 depending on the game mode and number of players. The Interactive Cones game system comes with a large LED scoreboard. Everyone can see the Green and Red Team scores in real time, allowing for more excitement and anticipation! This is a great addition to you bounce house rentals. These cones can also be used with our Inflatable raceway track for a competitive game like no other. We deliver to Dallas, Richardson, Plano, Garland, Irving, Carrollton, University Park, Highland Park and surrounding cities.